Industrial designer Marc Newson worked with Japanese swordsmiths, Czech glass makers and an American surfer to create the pieces currently on show at the Gagosian's Chelsea gallery. 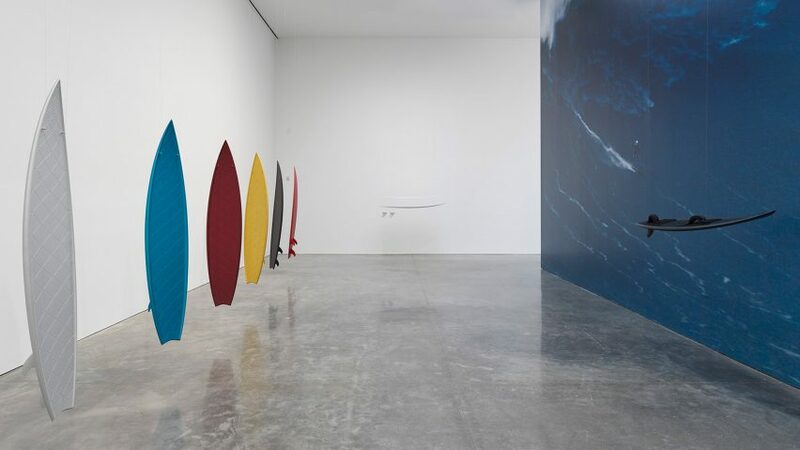 Newson designed the furniture, swords and surfboards in the exhibit at the Gagosian outpost on New York's West 21st Street to celebrate a variety of finishes and traditional crafts. "They're all materials, processes and techniques that I've been obsessed with since I trained as a jeweller and a silversmith, not as a designer," Newson told Dezeen at the exhibition's opening on 17 January 2019. Among highlights from the selection are a series of desks, chairs, and chaise longues that feature spotted patterns, floral designs and pebbly effects. Newson created these decorative finishes using an ancient technique known as Cloisonné, which involves metallic framework filled in with enamel. The designer spent years tracking down the technically adept craftspeople in Beijing, where Cloisonné production once flourished, to help him create the pieces. Another challenge was finding suitable equipment for Newson's creations. Cloisonné is typically used for much smaller objects, like homeware, and the final stage involves firing the enamel powder in a kiln. The designer therefore needed to build a particularly large oven for his pieces. "The oven is big enough to put a car in, but that didn't exist, there's no market for that stuff, even in China," Newson said. "I just love the impossibility of that process and re-contextualising it," he continued. "We had to reinvent it, it's bonkers." Another craft the designer aimed to revive for the exhibition is the production of traditional Japanese Aikuchi swords, after areas were "wiped out" by the tsunami that hit the country in 2011. "I was approached indirectly through the Japanese government to work with a Japanese craftsperson to help try to find a way to help reinvigorate their industry," he told Dezeen. Newson created six swords with an 11th-generation Japanese swordmaker, who is regarded as a "national living treasure", and three are on show at the Gagosian. "These things are dying, these industries, these skills," he said. "If it weren't for people like me who have specific requirements they would cease to exist." At the front of the Chelsea gallery exhibition are a set of cast-glass chairs, which are also one-of-a-kind due to their scale. Newson could only find one glass maker in the Czech Republic able to cast the hourglass-shaped chairs, which comprise two large parts. "There is one factory that can cast pieces of glass that size in the world," he said. "I challenge anyone to copy that thing. Good luck." The top half of each chair is a different colour – including dark orange, violet, blue and green – while the bottom is translucent. Eight surfboards also on display were born out of Newson's interest in the sport that dominated his upbringing in Sydney. "I never had an interest in surfing as an occupation but I had an interest in making surfboards because they're handmade still to this day," he said. "There are no places where you can go to learn that, people just end up doing it, so I was always fascinated by surfing." Among these is a metallic black board, which Newson created for American professional big-wave surfer Garrett McNamara. A video of McNamara using the board to ride a huge wave in Nazare, Portugal, is included in the exhibition. "McNamara surfs the biggest waves in the world," Newson said. "He had a specific requirements for me to design a surfboard that could cope with surfing such a huge wave." "Surfboards are not normally made from metal," he continued. "I came up with this idea because they need to be really heavy." Rounding off the exhibit are several decorative tables made with Murrina glass. These are created by knitting together tubular glass canes, which are then cut crossways to shape the design and offer a range of patterns. Shown all together for the first time, the diverse variety of pieces are representative of the designer's broad-ranging work and refusal to limit himself to a niche. His past works range include an all-diamond ring, colourful kitchen appliances, a limited-edition silver tea service, pens for Montblanc and Nike trainers. Mark Newson is on show from 17 January to 20 February 2019 at the Gagosian, 522 West 21st Street, New York City. Photography is by Rob McKeever, unless stated otherwise. All images are copyright Marc Newson, courtesy of Gagosian.